Tween Tuesday is a weekly meme that highlights great tween reads. Join the fun and post your own Tween Tuesday post in the Mister Linky below. About the Book: Marshall Seaver is being haunted. It starts with strange noises and symbols appearing to him, but then things get stranger. Marshall starts to see Gravedigger, a comic character he created. When his best friend Cooper disappears, Marshall must work together with Sydney, Cooper's "ice queen" sister to figure out what is happening. The two discover that something bigger than they ever expected is after them-and no one is safe. GreenBeanTeenQueen Says: I'll admit it-I'm a wimp-I can't do scary stories. But I have readers who love them, so I try to read some every once in awhile. Since D.J. MacHale's previous series, Pendragon, is very popular at my library, I was eager to give this one a try. There may be some things that could scare some readers, but for the most part, I didn't see why older tweens couldn't pick this one up. The book lists ages 10+ and I think that works, especially if you have tweens who are watching big screen scary movies! I think this would be a good pick for readers who are ready for the next step up from Goosebumps. The author used to write for the TV show Are You Afraid of the Dark? (anyone else remember that show?) and I thought this book had the same feel. The plot jumped around a lot, which might have been another reason it took me awhile to get into it. 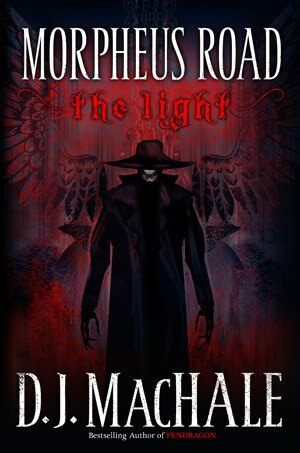 Readers looking for a good suspenseful read will enjoy Morpheus Road. This is the first in a planned trilogy, so while the story wraps up in some places, there are plenty of loose ends to give readers lots of questions. Give this one to readers who love scary ghost stories and are ready to move on from Goosebumps and Scary Stories to Tell In the Dark to something more. I didn't realize this was middle grade. I thought it looked scary. I may have to give it a try. Are You Afraid of the Dark use to be one of my favorite shows! Andrea-It's on the older end of MG and young YA. I think those readers who like scary stories and want something meatier to read will like it. Sounds like a good book. I'm not that much into description either. Glad I'm not alone. I met D.J. MacHale at an Ann Arbor book festival. He's such a nice person & a great speaker. LOL! I love being scared by books! I'm glad this is more MG because then I know I could really recommend it. I showed my students the trailer and they were super interested in it! I'm planning on booktalking it. I know my 7th and 8th graders will love it! My eleven year-old nephew will probably read this one. Thanks for the great review and letting us know about the age group of who should get this book. My daughter is ten, so I think I'll wait a couple of years on this one. Right now she's reading a very cute book by Natalie Tinti called "Sewing a Friendship." The story is about friendship and the backdrop is a fashion show the girls get involved in. I love how the author beautifully illustrated the characters and did a little bio for each one. My daughter tells me it's an easy read. You should check it out! Thanks for the suggestion Audrey-I'll have to check it out.